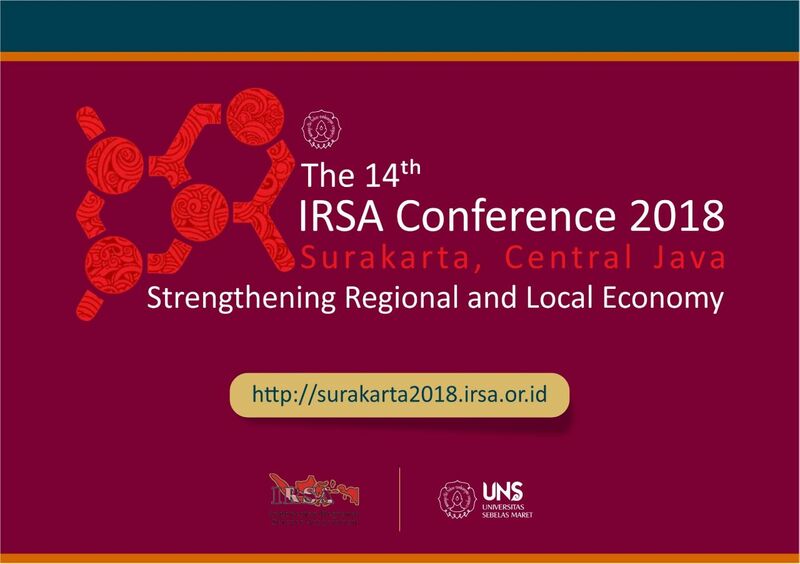 Faculty of Economics and Business (FEB), Universitas Sebelas Maret (UNS) Surakarta collaborates with Indonesian Regional Science Association (IRSA), academic organizations that actively promote the advancement of research in Indonesia, to hold 14th IRSA International Conference. The annual conference will be held in Surakarta on 23-24 July 2018. The big theme for this year is Strengthening Regional and Local Economies. 14th IRSA International Conference presents various speakers who are experts in their field. Speakers from Indonesia include Mari Pangestu, Minister of Tourism and Creative Economy 2011-2014, and J. J. Sarungu, Professor of FEB UNS. The international speakers include Lisa Cameron, Australian empirical development economist, and Yuri Sato, Executive Vice President of the Institute of Developing Economies, Japan External Trade Organization. Registration is now opened and divided into early bird and regular registration for participants, presenter, and student presenter. Early bird stage will still be open until June 1, 2018 with registration fee of 700,000 IDR for participants, 950,000 IDR for the presenter, and 700,000 IDR for student presenter by showing student ID card.